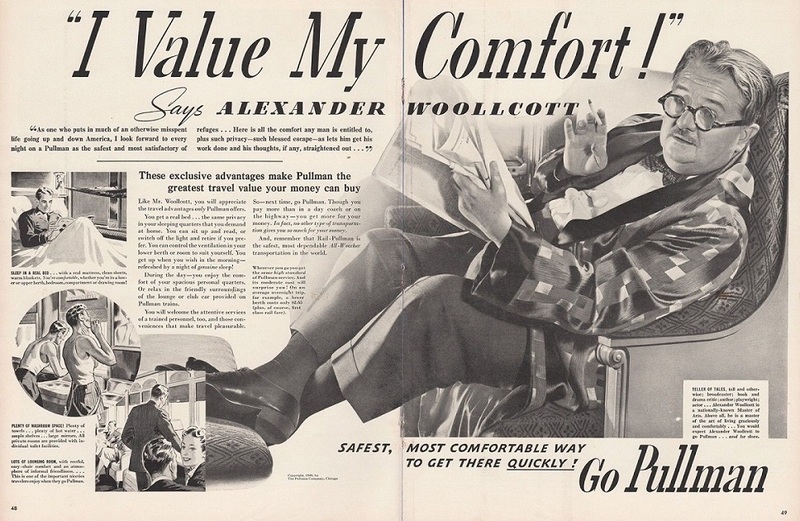 Pullman Company advertisement featuring Alexander Woollcott, 1940. Its main character, Sheridan Whiteside, was transparently based on one of the most dramatic, infuriating, and improbable celebrities of the era between the wars: Alexander Woollcott. Woollcott was a drama critic, raconteur, radio host, essayist, and charter member of the fabled Algonquin Round Table, but that barely suggests his influence then on middlebrow culture. He was a tastemaker of popular fiction on a scale that would have made Oprah Winfrey’s encomiums seem like fortune cookie messages. His barbed wit would have sliced Simon Cowell for breakfast. . . . Although the idea for a play based on Woollcott’s “character” came from Woollcott himself, he eventually removed himself from the production. Hart and Kaufman were wondering how to pursue the project when Woollcott visited Hart’s home for an overnight stay, treating the members of the household abhorrently and complaining the entire time. Aghast, Hart described the nightmarish guest to Kaufman and wondered aloud how horrible it would have been if the Woollcott had been injured and had to stay there the whole summer. Thus was born the central premise of what became the final play. The show would prove to be a huge hit, featuring Monty Wooley in the lead role and running on Broadway for 739 performances—“an exceptionally long run in 1939–40,” notes Jared Brown in his biography of Hart. And what did Woollcott think of Kaufman and Hart’s biting portrait of him as an unbearably cantankerous misanthrope? In short, he loved it. When the play went on its West Coast tour, he even stepped into the lead role, treating audiences to the sight of a celebrity acting as a satirical version of a character based on his own public persona. At the end of one performance, cheered on by repeated curtain calls, Woollcott riffed off one of his character’s signature lines from the play and announced to the audience that he planned to sue the authors for $150,000. ‘All right, Mr. Kaufman?’ the stage manager asks. . . . ‘Yes, any time you’re ready.’ . . . George S. Kaufman has a whispered colloquy with Monty Woolley. He stands centre stage surveying the green living-room-hall in Mesalia, Ohio, which Donald Oenslager has designed for The Man Who Came to Dinner. . . . If you don't see the full story below, click here (PDF) or click here (Google Docs) to read it—free! ...since I thoroughly enjoyed the play when on telly with Monty Wooley years ago. Morton Eustis's Essay on George Kaufman reveals what a painstaking affair directing is . I am an avid play watcher but I didn't know there was so much of hard work behind the scenes, to rid the play of "dead chunks," so that the finished product can earn critical acclaim. The director has to be an acute watcher,a knife-happy surgeon, a good coordinator or the sound and light effects can go wrong. The insights the article has given me, I am sure,will help me appreciate drama better. Thank you. That was fun. I've seen the play on the stage done by a high school group--the senior-class play. It's obvious from this article how much work it took to make this play forever successful. It was hilarious even though the school administration insisted on cleaning up the language. The censors finally allowed one line--something like "Trapped like a rat in this damned house" and it worked great even through some audience embarrassment. Fun, fun article. Thanks a lot.